The Netherlands and Great Britain have always been advocates of the music of Leoš Janáček (1854-1928). Both countries have performed his operas regularly and in half of all studio recordings of ‘Káťa Kabanová’ there is British participation. Therefore perhaps, De Nederlandse Opera (DNO) has chosen mainly an Anglo-Dutch cast for the reprise of ‘Káťa Kabanová’. The world première of ‘Káťa Kabanová’ took place on November 23, 1921 in Brno, the place where most of Janáčeks nine operas were premièred. ‘Káťa Kabanová’ and ’Z mrtvéno domu’ (Holland Festival 2007) are his only “Russian” operas, the story of ‘Káťa Kabanová’ is based on a play by the Russian author Ostrovsky and the economical libretto is by Janáček himself. For the title role his 38 years younger object of his unreturned love Kamilla Stösslová served as a model (“My Káťa grows in her, Kamilla”). Janáček composed color spectra. He was not interested in instrumentation but in compositions of timbre. In most of his operas the themes used in one scene rarely returned, but in ‘Káťa Kabanová’ the themes are a sort of ‘Leidmotiven’, that are serving the network of musical form and keep on coming back in the work. Yakov Kreizberg and the Nederlands Philharmonisch Orkest beautify the more cosmopolitan, Prague style of Janáček with its lyricism and warm colors rather than emphasizing its rough Brno style. The British Amanda Roocroft is a heart-rending Káťa. Her lyric dramatic soprano grows and changes wonderfully with the flexible, distinctive music of Káťa. Jaco Huijpen is a full voiced and convincing Dikoj. Kurt Streit is imaginative as Boris and reminds us stimmlich of Marcel Reijans, who sang the role in ten years ago for the Nationale Reisopera (NR). The Austrian-born Natascha Petrinsky sings Varvara with a big, round mezzosoprano. As Amneris she would have done well, but her voice is a bit oversized for Káťa’s foster-sister-in-law. The British veteran Kathryn Harries gives a good two-dimensional caricature of the tyrannizing mother-in-law. Her voice lacks strength in the middle register and the jumping up and down between middle and chest register over an obvious break is a matter of taste really. Corinne Romijn, in this DNO reprise (just like in 2000) an outstanding Gláša, was an excellent Varvara back in 1998 with NR. Other notable Dutch contributions come from Klara Uleman as Fekluša and Roger Smeets as Kuligin. The Koor van DNO sings according to Janáček “like the Volga sighing”. This ‘Káťa Kabanová’ is a production by Willy Decker (Köln, 1950). Decker belongs together with Nikolaus Lehnhoff to a group of directors, who brought “slowness” into their concepts. Decker is practical and his mise en scènes are clear, understandable and obvious. They are aesthetic and do not disturb. However, this does not work for Janáček. Two typical Decker ingredients eventually cause this ‘Káťa Kabanová’ to lose its tension. First, the décor is a bold construction box without much variation. Second, one single symbolic element dominates the concept; here a bird as symbol of freedom. Everything in Deckers ‘Káťa Kabanová’ is concentrated on this thematic element, which anticipates the end of the opera and at the end becomes boring. 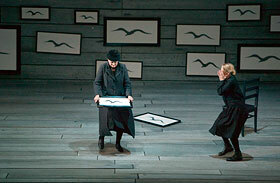 Like ’Z mrtvéno domu’ (Holland Festival 2007) is ‘Káťa Kabanová’ performed by DNO without an interval. Janáček himself insisted on the first two acts being played non-stop without a break and an interval before the short third act would indeed have been superfluous.